The unified voice of Licensed Architects who design homes in the USA & world. ArCH is the independent professional society that represents the interests of Licensed Architects who create residential architecture. Is your architectural practice perfect? No? Are there aspects that you know need improvement, but you can’t seem to obtain solutions from whatever organizations you belong to at present? You might want to give ArCH a try. ArCH was created for one purpose: to Improve Residential Architecture in all its aspects: business, design, and just about anything else you might wish. Click on the image above to printout the outer page of the ArCHpamphlet. 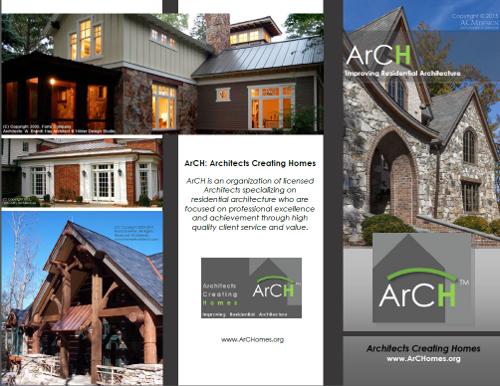 ArCH is an American-based INTERNATIONAL organization of Licensed Architects focusing on residential architecture, professional excellence & achievement, Client value & service. 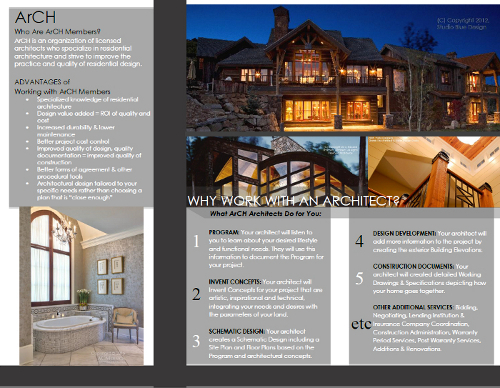 ArCH improves the quality & practice of residential architecture. Click on the image above to printout the inner page of the ArCHpamphlet. If you are one of the Public, seeking an architect to design your home project, Click on the menu above “Find an Architect” or on the green button to the right “Find an Architect to Design my Home”. Review the qualifications of our ArCH member architectural firms. This group has one type of member: real, licensed Architects, who create homes for their clients. What kind of homes? Small, medium and large. Budget-oriented, to moderate, to higher-end and everything in between. If you might be interested in Reasons Why An Architect Should Design Your Home, <– Click these words. If you are a licensed architect, whose practice is mainly devoted to residential architecture, then this is the professional organization for you. We of ArCH welcome you and invite you to consider membership. Just click on the menu item “Membership” above (or click here–> Membership). If you have been frustrated with not having a group VOICE for what you do; this is it. Informing the public of the value architects bring to home design. Improving the practice of residential architecture. Creating products for use by Architects tailor made to residential practice. Protecting the Health, Safety & Welfare of the public (nearly all of whom live in housing of one form or another). Improving the technological aspects of residential architecture. Promoting quality residential aesthetics of a varied nature. Improving information exchange between licensed residential architects. Promoting friendship and assistance between members . Creating sustainable revenue streams for our members & the ArCH organization. To solicit, encourage and strive for architectural licensure for home design throughout the USA.